The Penguin has teamed up with Mr. Freeze and it’s up to Batman, The Flash, Green Arrow, and all of their friends to stop them in this action-packed novelization that includes an eight-page full-color insert with stills from the Batman animated film, Mechs vs. Mutants! Using Mr. Freeze’s technology, the Penguin has super-sized Killer Croc, Chemo, Bane, and Clayface—and the giant villains are doing their best to level Gotham City for good. Batman and Robin team up with The Flash, Green Arrow, and Nightwing to control the damage, but the five heroes can only do so much. 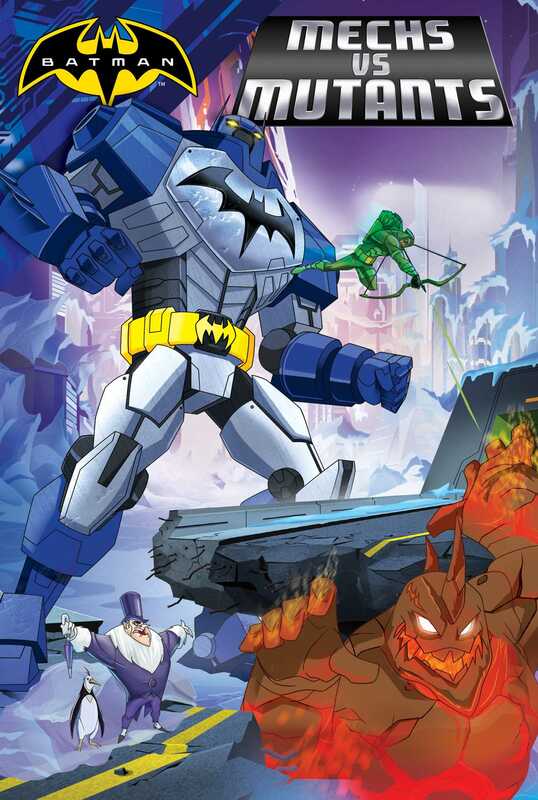 Luckily, Batman has his own brilliant scientist up his sleeve: Dr. Kirk Langstrom has engineered two massive mech suits to help Batman and Green Arrow put the Penguin’s plans on ice. But will two superheroes in mech suits be enough to stop all six villains? The giant stone mansion known as Wayne Manor stood on a hill at the eastern edge of Gotham City. Wayne Manor was an isolated and formidable fortress, shielded from trespassers and prying eyes by towering walls and a state-of-the-art security system. It was the home of Bruce Wayne, who was the heir to a vast family fortune. He was also the CEO and chairman of Wayne Enterprises, by far the most profitable corporation in Gotham City. But despite his public persona, Bruce Wayne was also a man of many secrets. One of Bruce Wayne’s secrets was that every night he became Batman, the crime-fighting Dark Knight of Gotham City. Clad in a cape, a cowl, and a dark uniform, he prowled the city’s dangerous streets and struck terror into the hearts of cowardly criminals and evil super-villains. Another of Bruce Wayne’s secrets was the location of Batman’s secret headquarters. It could be found far below Wayne Manor, in a vast series of caverns known as the Batcave. Only Batman’s closest allies were allowed to visit the Batcave, which was filled with high-tech equipment and vehicles that helped him keep the city’s crime at bay. Tonight, as Batman patrolled the dark streets of downtown Gotham City, one of his youngest associates was sleeping in a chair, resting his head over the Batcomputer. An open holo-book lay just inches from his fingers. Above the book was a holographic screen that was projecting pages from the book, showing images of Gotham’s deadliest villains. The teenager slumbering in front of the Batcomputer was Damian Wayne, the most recent hero to don the mantle of Robin the Teen Wonder. As Robin, Damian’s main mission was learning all he could from Batman—how to fight, how to make a plan, how to keep his city and all the people in it safe. But at the moment, the only crime Damian was fighting was in his dreams. The soft sound of his snoring echoed gently through the Batcave as he slept. Another person was creeping up behind him, walking carefully down the long flight of stairs and balancing a tea tray in his arms. It was Alfred Pennyworth, the dignified British butler who was one of the Dark Knight’s most loyal allies. Alfred had practically raised Bruce since he had been orphaned as a boy. The butler was always there to help—whether he was helping Batman research a deranged villain, or simply preparing a late-night snack of Darjeeling tea and turkey sandwiches. Alfred paused to gaze at Batman’s dozing sidekick. The butler shook his head sadly, and then he cleared his throat. Robin’s head shot up, and he quickly turned around. Robin let out a deep sigh as he reached forward and touched the holographic screen that floated inches above the Batcomputer. The screen instantly displayed a video labeled Bird on a Wire. The video showed Damian in his Robin uniform, standing high atop a building in downtown Gotham City. Next to him stood the Joker, one of Batman’s deadliest opponents. Batman quickly fired a roped Batarang toward his young partner, which wrapped around Robin’s ankle and stopped his rapid descent. Seconds later, Robin was dangling upside-down, his cape covering his face as he swayed in the breeze. Batman’s fist slammed into the Joker’s stomach, knocking the villain over. As Robin struggled to free himself from the rope, he noticed a young boy on the street below him. The boy was pointing a video camera directly at Robin, recording his every move. “Hey, stop filming!” Robin cried out in dismay. Tim Drake was the third young man to have fought crime as Robin, and he was Damian’s immediate predecessor. Now Tim was fighting crime on his own as the hero Red Robin. Robin and Alfred both looked up to see the Batmobile come roaring into the Batcave. The vehicle screeched to a halt on top of a revolving platform. Batman jumped out of the Batmobile and approached his friend and apprentice. “Master Bruce, I’ve prepared tea,” said Alfred. “Thank you, Alfred,” said Batman as he glanced over at Robin. The young man was peering closely at the holographic book projection again. Robin pointed to his holographic screen. A short and stout man wearing a long coat and an old-fashioned top hat appeared on the screen. “Hey, who’s this little guy?” Robin asked with a chuckle.